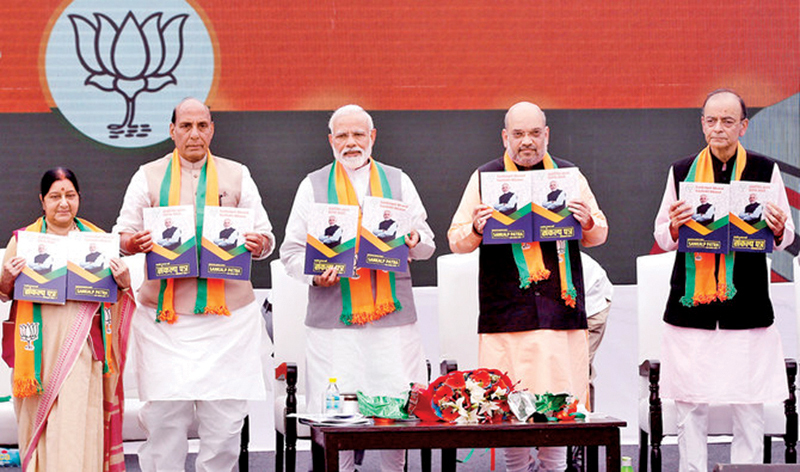 INDIA: India’s ruling Bharatiya Janata Party (BJP) released its election manifesto on Monday, with a strong focus on national security and tackling illegal immigration. Listing the party’s achievements in the past five years, the manifesto says the BJP government has been free of corruption, and India has gained new recognition internationally because of its aggressive foreign policy. With the BJP facing a tough challenge to retain power in 2019, its manifesto is aimed at its core constituency and is playing the nationalism card. It also makes a string of promises to disaffected farmers, promising to double their income by 2022 and assuring them of a pension after the age of 60. To win back small traders who were at the receiving end of the government’s new tax regime and its decision to demonetize the currency in 2016, the BJP has promised them easy access to bank loans and a pension scheme that will take care of them after the age of 60. The manifesto promises to make India the world’s third-largest economy by 2030. “We commit to make India a $5 trillion economy by 2025,” it added. However, the manifesto’s major focus is nationalism and national security. The BJP reiterated its commitment to build a Hindu temple at a disputed site in the eastern city of Ayodhya where the Babri Masjid mosque was destroyed by Hindu nationalists in 1992. The first phase of voting starts on April 11, and the result will be announced on May 23. Most opinion polls give the BJP an edge over the opposition, but pollsters say the ruling party might lose a third of the seats it won in the 2014 general election.